Add a 15 minute scenic flight from Rainbow Beach or Hervey Bay for just $79! 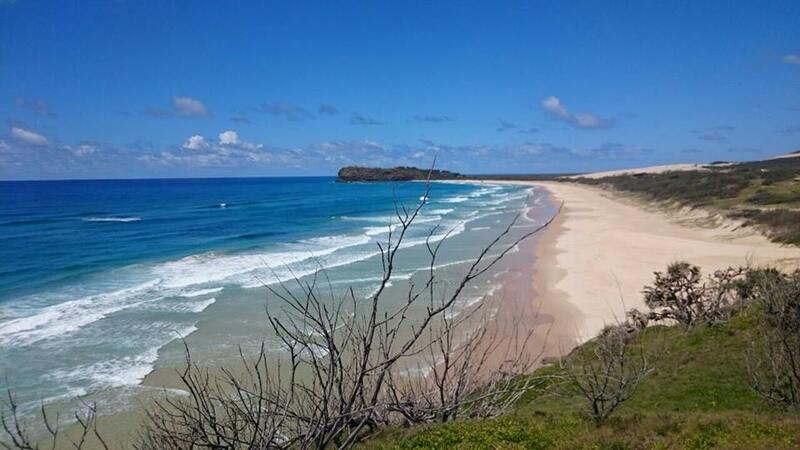 Add a 1.5 hour horse ride on Rainbow Beach for just $119! Book your discounted Fraser Island 1 day tours here. Visit the beauty of Fraser Island with passionate guides on this island paradise and see the best of secluded lakes, rainforest, wild dingo’s and so much more that you never thought possible. Discounted prices for Fraser Island 1 day tours help you save while giving you the most for your money! Fraser Island Ferry Crossing – Inskip Point to Hook Point. 75 Mile Beach travel via Eurong or Happy Valley. Inland 4WD Sandy Forest Tracks; Satinays, Kauri Forest etc. Midday lunch stop and swim – normally 11/2 to 2 hours at crystal clear freshwater Lake McKenzie. Sizzling barbecued sausages appetiser, followed by your choice of prime rib fillet steak or delicate white fillet of fish with lemon, fresh salads and complimentary drinks (all included in price). We also cater for vegetarians. Lush Rainforests – luxuriant canopy of palms and vines – don’t forget your camera for the magnificent forest walk! Wildlife – dingoes, goannas, snakes, dolphins, whales and birdlife. Afternoon tea provided on homebound leg. Departs daily. No extras. Visits Lake McKenzie. BBQ Lunch with complimentary beer, wine & soft drinks. Free beer/wine! For all passengers over the age of 18. Whats Included: Free pick up, Expert Tour Guides, Morning/Afternoon Teas, Noosa River Barge, Fraser Island Ferry, National Park Fees, BBQ Lunch, Complimentary drinks. No other company offers such small group sizes with just 17 passengers (usually less!) – promising fantastic personalised service from our guides. The tour visits the hottest spots on Fraser Island including; Lake Birrabeen, Central Station rainforest, 75 Mile Beach, Maheno Shipwreck, the coloured sands and Eli Creek. Air-conditioned 4WD bus, morning tea, picnic lunch and fresh fruit and cold beverages. Discounted Fraser Explorer 1 Day Tour Fraser Island! Your guide is a Fraser Island expert with local knowledge and a passion for the island. On this adventurous day out, you’ll drive across sand tracks to explore some of the most beautiful, natural spots and listen to fascinating facts about the island’s history, fauna and flora. A custom designed 4WD bus is ideal, and air-conditioned for your comfort. See Central Station, Wanggoolba Creek, Lake McKenzie, Seventy-Five Mile Beach – drive down Fraser Island’s own highway and keep an eye out for dingos as well as Air Fraser, taking off and landing right on the beach. You can take this scenic flight as an optional extra and see the island from a birds-eye view. Eli Creek, Maheno Shipwreck, The Pinnacles, Coloured Sands. Price from: $210 adults off-peak, $138 children (aged 4-14) off peak. Whats Included: One day guided Fraser Island adventure, courtesy pick-up and drop-off, return ferry transfers, buffet lunch at Eurong Beach Resort, National Park fees and fuel levies. Extras: Booster seats are available to hire at $20 per infant (under 4yo) and must be booked at the time of booking. If you have your own booster seat you are more than welcome to bring it. Our award winning Fraser Island 1 day Hummer tour promises exclusivity and style for the discerning traveller. No other company offers the thrill of a Hummer and the exclusiveness of such a small group – maximum of 4 guests per tour – providing personalised service from our experienced and friendly guides. Our fleet of current model air conditioned 4×4 H3 Hummers are perfect for Fraser Island’s unique off-road touring environment. The tour departs Hervey Bay every day with the exception of 25th and 26th December. Whats Included: Experienced and friendly guide, personalised service, all fees and transfers, morning tea, individual gourmet picnic hampers, a special afternoon tea with sparkling wine and strawberries, and all beverages including bottled water, beer, wine and soft drink. 4 people only per vehicle. During the day you will touch on and appreciate nature’s magnificent paradox. Seemingly endless golden beaches encompass towering hardwood forests, barren heathland, pristine rainforests, huge creeping sandblow deserts, crystal clear freshwater lakes, gurgling blood red streams, prehistoric ferns, mosaic coloured sands. Sandy Straits Ferry Crossing, Seventy five Mile Beach, Lake McKenzie, Central Station rainforest Walk, Eli creek – Largest Freshwater Creek, Maheno Shipwreck, BBQ Lunch & Drinks, All Fees & Ferry, Dress Casual, Don’t forget swimmers, camera and towel. Whats Included: Seventy five Mile Beach, Lake McKenzie, Central Station rainforest Walk, Eli creek – Largest Freshwater Creek, Maheno Shipwreck, BBQ Lunch & Drinks, All Fees & Ferry, Dress Casual, Don’t forget swimmers, camera and towel. We can also help you book your travel Australia-wide! If you need an east-coast package put together, or would like to book your Uluru or Tassie adventures, please just ask our friendly staff and we’ll do everything we can to help you out.